University researchers have discovered that most of the children of parents who’ve been fined or threatened with a fine over school “truancy”, have SEND or mental health issues. In England and Wales, in 2017, ten parents were jailed for the offence of truancy, for not ensuring their child(ren) are regularly in school. Nine of them were women. SEND parents reading this will not be at all surprised at the results of this survey, even though it’s only of relatively small size. But researcher, Rona Epstein, of Coventry University’s Law School, says the results show show that that non-attendance at school should be treated as child welfare, and not a criminal justice, issue and she’s written for us about the research. The above extract is from a letter written by an educational psychologist working with parents of children and young people, some autistic, many with a range of SEND (Special Educational Needs or Disability). It was the starting point of this research study on the prosecution of parents whose children do not attend school regularly. In England and Wales, the offence of truancy is deemed to have been committed by parents of school age children who have not attended school regularly, missing 10% of school sessions. The offence is strict liability, which means that the prosecution does not have to prove intent to commit the crime or even that the parent was aware that the child was missing school. The punishment can be a fine up to £2,500 or a term of imprisonment. 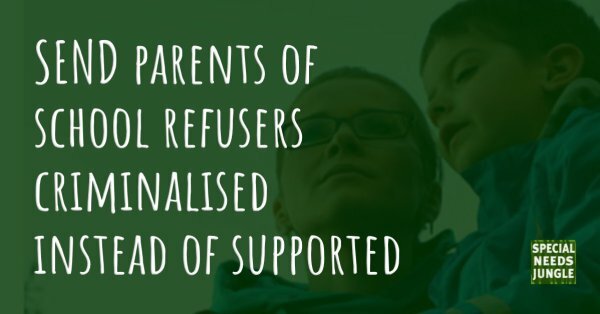 Many children who are persistent truants/school refusers are on the autism spectrum, have SEND and are highly anxious, many have been bullied and are frightened of school. Many of the children and young people who do not attend school regularly have moderate or severe mental health problems. 16,406 people were prosecuted for truancy, of whom 11,739 (71%) were women. 12, 698 were convicted, of whom 9,413 (74%) were women. 110 people were given a suspended sentence of imprisonment, 88 (80%) were women. 500 were given a community order – 416 (83%) were women. Ten people were sent to prison, nine were women. It is clear that women are disproportionately pursued for this offence. Our research set out to get first-hand testimony from parents who have experience of the system. We placed online an anonymous questionnaire asking parents whose children have missed school about their child’s health, whether they had special educational needs or a disability (SEND), whether their child had been bullied, what were the circumstances of the parents and other family members, and whether or not they had been prosecuted or threatened with prosecution. 126 parents completed the questionnaire giving information on 132 children. About 40% of the children were reported as on the autism spectrum. Many of them had other health issues. 90% of the children had SEND or a health problem, and almost all were very anxious. Some 60% of the children had been bullied in school, mostly by other children and some by school staff. Bullying was an important part of the experience of many of the children in this survey – 60% of the children had been bullied: mostly by other children, but a significant number by staff. Some of the incidents of bullying described were extremely serious: for example a child punched in the stomach leading to hospital treatment for a damaged bowel. One parent reported that her child was locked in a cupboard in his special school. The parents described their children as suffering night terrors and having extreme fear reactions when it was time for school. Some described acts of self-harm, and threats of suicide. All the parents had tried, without success, to get their children to go to school regularly. Despite their best efforts many of these parents faced threats of prosecution or had fines imposed. Many were on benefits or low incomes and found it hard to pay fines. Some European countries take a child-welfare rather than a criminal justice approach to the child who does not attend school regularly. In Denmark, for example, there are no criminal prosecutions for parents whose children miss school. It is evident that the punitive approach leads to harm for parents, children and vulnerable families. It also appears to be ineffective in getting reluctant and fearful children back into the classroom. The current law is cruel and discriminatory and does not achieve its purpose of reducing the number of children who do not attend school regularly. Our main conclusion and recommendation is therefore that the criminal law should not be applied to parents whose children do not attend school regularly. It should be a civil matter – a child welfare issue.